Amelanchier x grandiflora 'Autumn Brilliance' is a fabulous all-rounder, offering spring flowers, summer berries and autumn colour foliage. The white star-shaped flowers in spring are lightly fragrant and very popular with bees and butterflies. In spring, the young foliage emerges bronze and matures to a mid-green. In summer, the Juneberries arrive which are eaten by birds. As the name suggests, this variety has fantastic autumn coloured foliage with the leaves turning a mixture of red and orange, before finally falling to the ground creating a fiery ring of colour around the tree. With a height and spread of 4x4 metres in 20 years, Amelanchier x grandiflora 'Autumn Brilliance' makes a wonderful small tree that provides fantastic seasonal interest and is suited to most garden sizes. 'Autumn Brilliance' will grow well in a moist, slightly acidic soil. For the best autumn colour, plant in full sun and mix in some ericaceous compost. Our pot grown Juneberry Autumn Brilliance trees can be planted at any time of the year. Start by removing weeds and grass within a metre of your desired planting hole. Dig a square hole as deep as your root mass and approximately 2x as wide. To help the tree establish more effectively, sprinkle root grow in the hole. Remove the pot, gently loosen the roots and place into the planting hole. Mix 50% of the original soil with 50% compost, fill in the hole and firm around gently. Avoid banking the soil up around the collar of the tree. 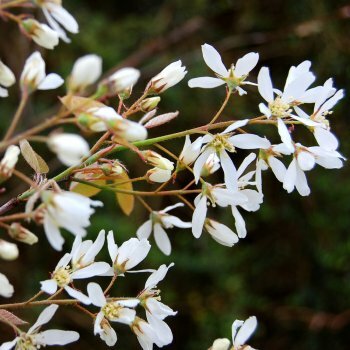 We recommend planting Amelanchier trees with a stake and tie - instructions are in the planting guide. Amelanchier Autumn Brilliance requires minimal pruning and you can just remove crossing, diseased or untidy looking branches. Juneberry trees can handle hard pruning if desired but it will mean less flowering in the following spring, so we recommend leaving pruning until after flowering. A good tip when pruning Autumn Brilliance is to remove any growth that is older than four years as this will improve the shape of your tree and encourage fresh bud and flower growth.